This Sunday, September 10 (12pm-3pm) is the annual return of one of Santa Barbara's finest fundraisers--Taste of the Town. (Tickets still available--go to that link.) Now in its 36th year (for some perspective, 1981 was the year Ronnie Reagan was inaugurated, for the first time), TotT supports the Arthritis Foundation, and there's no better way to help raise money to fight chronic pain than eating and drinking well. I had the opportunity to email interview Laura Kath, local PR maven (and arthritis sufferer), who offered the lowdown on this year's event. Kath calls it "the incredible opportunity to meet area chefs, vintners, culinary, wine and food legends and legends in the making—in a one-of-a-kind magical setting AND raise needed funds to help find the cause, cure and provide hope for more than 50,000 people in Santa Barbara County with an arthritis diagnosis. Best blend ever!" Turns out Kath has been volunteering for AF since year 5 (1986), and she points out, "When I first started, there were more restaurants/caterers than wineries and we didn’t have any craft breweries or distillers at all, for example! 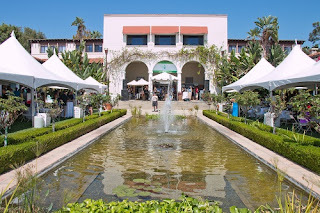 The culinary and wine scene has evolved so much over the last 36 years here in Santa Barbara County and Taste of the Town really reflects all those changes including the emphasis on locavore, farm-to-fork and certainly more great wines." That adds up to 19 restaurant partners and 37 beverage partners for 2017. And it's an incredible mix of veterans and fresh faces, too: think the likes of Chef Brenda Simon and Ca'Dario and Michael's Catering and Renaud's and The Nook on the food side with the likes of Brander and Cutler Artisan Spirits and Potek and Press Gang and Refugio Ranch and Third Window on the drink side. We are very lucky to live in Santa Barbara. It turns out Doug and his wife Marni were also crucial help in finding this year's culinary honoree, Mark Strausman. Their recommendation earlier this year led the TotT committee to discover "Strausman's outstanding culinary career AND that he also has an arthritis diagnosis and is very committed to the cause of being a champion of YES for the Arthritis Foundation!" says Kath. Strausman has led a storied career as one of New York's most heralded Italian-focused chefs, turning the restaurant at Barney's into one of Manhattan's top party spots. Of course one of the greatest charms of the event is its location in Riviera Park, the home of UCSB way back when. The entire 2017 event is in the late philanthropist Michael Towbes' memory, and Kath stresses, "Michael Towbes and his family’s support of the AF has been outstanding over four decades and crucial to the success of Taste of the Town event since he has donated use of Riviera Park venue since the beginning. No other charity event has been granted the gift of this extraordinary setting—it makes Taste of the Town Santa Barbara spectacular!" This place looks so amazing and the town has such a great environment with so many greenery, it is really a must visit a place I think.